Over the course of the evening, Paul plays 26 songs in just under two hours, drawing from his career of 50+ years as a member of the Beatles, Wings, and as a solo artist. By any standard, the concert was incredible, but the audience did more than just experience a concert. Whether they realize it or not, they also participated in an exciting, memorable experiential marketing campaign—one that communicated to them, and all of us, Paul’s brand identity. Experiential marketing is emotional and memorable. It makes an impression, can generate a lot of buzz, and lends itself particularly well to fostering brand relationships with audiences. But it’s often confused with event marketing. The misconception is understandable, especially when the “experience” happens to be an event. But the key difference is communication. Event marketing is one-directional, with brands speaking to audiences, and audiences passively listening. In contrast, experiential marketing is interactive branding, with communication going both ways—allowing audience members to contribute to the experience and build unique relationships with the brand. That’s the kind of experience Paul was hinting at when he started mentioning in interviews an upcoming “secret concert”—one that would occur Friday, Sept. 7, somewhere in New York City, to celebrate the release of his new album, Egypt Station (which is a pretty good album, by the way). The buzz, of course, was huge. A secret Paul McCartney concert in NYC? Fans and media outlets were abuzz, and people throughout the city tried winning tickets by following Paul on social media and entering the concert code into their Lyft apps. By Friday, about 200 winners were selected, and that evening, they were brought by Lyft to the surprise venue: Vanderbilt Hall in Grand Central Station. There they participated in the McCartney experience of a lifetime. The venue itself was intimate, with just 200 audience members and a handful of celebrities mixed into the crowd. The effect, I’m sure, was surreal for attendees, to be standing on equal footing with Meryl Streep, Chris Rock, Amy Schumer, Jimmy Fallon, and Jon Bon Jovi, everyone there gathered to see one man: Paul McCartney. Paul himself was charming and accessible. The stage was low, and people were close enough to potentially reach out and touch him. He sang with surprising vigor, especially considering his age, and he bantered with the audience, told stories about the Beatles, discussed song inspirations, and had the crowd sing and dance. While many musicians do the same at concerts, the effect was entirely different with someone as iconic as Paul McCartney in such a small, intimate venue. Throughout the night, Paul directly connected with individuals in the audience. For example, at one point, he prefaced a song by explaining it was about bullying. He asked if anyone in the crowd had ever been bullied, and a few people responded. Paul asked two women to come onstage and share their stories—the first bullied for being uncool in high school, and the other, ironically enough, bullied for being a Beatles fan. The moment was emotional and reaffirming, but it became candidly humorous as Paul asked for the names of the bullies. The crowd went “oooh!” and laughed, and Paul playfully called the bullies out before beginning the song and inviting the women to stay onstage to dance. “To prove it!” the man responded. Paul also worked to immerse the crowd in the experience, both musically and aesthetically. Early on in the show, during “Letting Go,” he sent his trombone, trumpet, and saxophone players into the middle of the crowd to play. 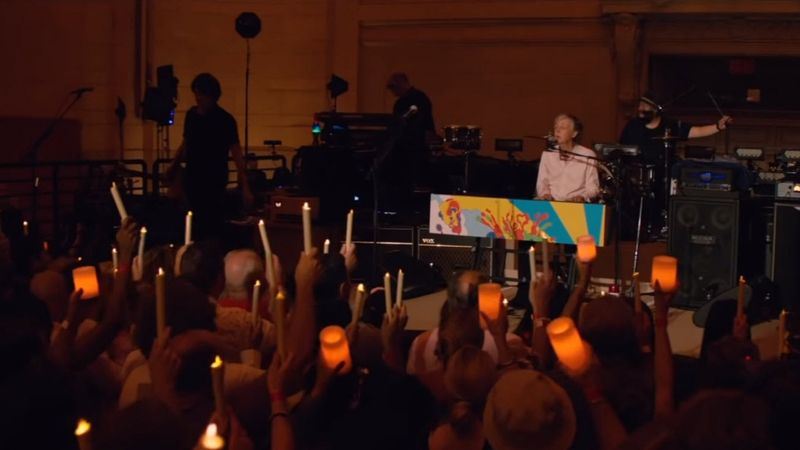 Later, when he sang “Let it Be,” the lights were dimmed, and the crowd was given electric candles and lanterns to illuminate the darkness. “I’m coming amongst you,” Paul said at one point, grabbing his acoustic guitar and walking out through the crowd. He shook hands and made eye contact with fans as he made his way to a slightly elevated platform at the center of the crowd. From there, he sang “Blackbird,” projecting notes of authenticity and even vulnerability as he fumbled a few lyrics. Throughout the concert, Paul fostered this atmosphere and its interactions to create a unique experience, but also to communicate to the crowd who he is and what he represents. He’s a legend, but down-to-Earth. He’s one of the most successful musicians in the world, and yet he cares about his fans and their lives. He loves to have a good time. On Friday night, he built this brand identity with 200 individuals, but also broadcasted it to the world over YouTube Live—a particularly important move as he tries to make himself known to younger audiences who didn’t grow up listening to his music. The result? An unforgettable experience for the crowd, with many having had a unique interaction with Paul. And for those of us watching at home, while we weren’t physically there, Paul’s brand message came through loud and clear. Make it interactive. The big difference, again, between a normal event and an experiential one is communication. You need to design your experience so that it’s not just your brand talking to the audience, but your audience talking back and shaping the messaging. Paul did so by conversing with the crowd, bringing them onstage, having them sing and dance along, and entering the crowd to sing among them. Whatever your campaign, you should strive to move your audience away from passivity and into active participation. Make it emotional. Emotion is perhaps the most important element of experiential marketing. It’s what makes the experience memorable, and it’s the foundation of the brand relationships you form. 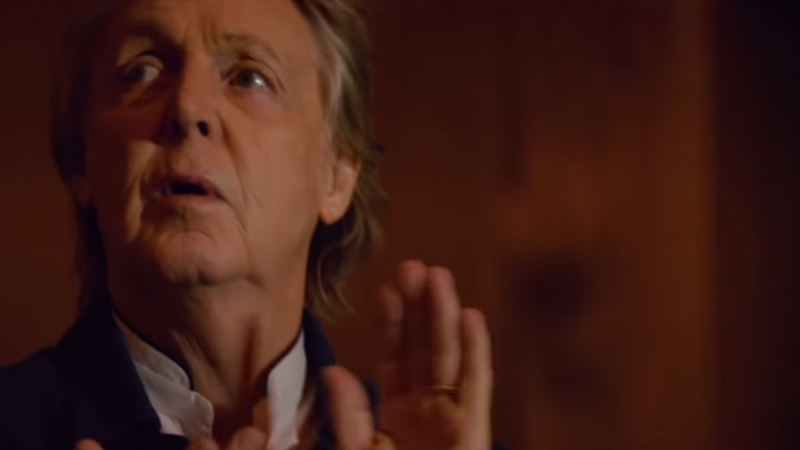 Paul made the concert range in emotion from touching to joyful by making himself intimately available, telling candid stories about his decades-long career, and asking audience members to share stories of their own. If you’re planning an experiential marketing campaign, be sure to identify which emotions your brand wants to bring out in people and tailor the experience to do so. Spread the word. In the days leading up to your experience, alert the press so they can be there to cover the story; and as long as it isn’t meant to be a surprise, be sure to drum up excitement within your audience to boost attendance. Paul did so via interviews and social media, and the result was extensive media and fan attention leading up to (and after) the performance. Create shareable content. Experiential marketing can project your message far and wide, but you’ll need to facilitate that through shareable content. That can include, among other things, social media posts and video clips from the event. Paul livestreamed the concert on YouTube with a shareable link, but even after the concert, he posted smaller, more digestible clips of him performing each song. You can take the same approach with video and social media, so long as you tailor it to your specific experience and audience. Drive traffic to key channels. The end-goal of experiential marketing campaigns isn’t to sell products (although it can boost sales), but to build brand relationships and disseminate that messaging across audiences. Part of that can, and should, involve boosting your presence on key platforms. Paul, for example, incentivized fans to follow him on social media with the chance to win tickets to the concert. He also drove traffic to his YouTube channel by posting the livestream recordings, which in turn gave more exposure to the Egypt Station music video he released days later. While planning your campaign, be sure to identify the channels you want to boost, so you can effectively direct your audience there. With those guidelines, I leave you now with Paul’s secret concert at Grand Central Station, so you can watch him in action yourself. The concert begins with a nod to “Hey Jude,” and ends with the final three songs from Abbey Road—the last album the Beatles recorded together (for you Beatlemaniacs out there). So kick back, hit play, and enjoy getting to know Paul.